DIY masters want to have their very own power drill and photography buffs need their proper camera. However, the majority of people only need these kinds of items perhaps once or twice a year. The solution: renting instead of buying. The Munich startup useley took a closer look at this concept. The result: the launch of a platform in late 2015 where products such as cameras, drills and video-game consoles can be rented from other people. It gives one group affordable access to products that they rarely need, and allows the other group to earn money with their own products — and lots of resources are saved in the process. The three founders of useley complement one another well. Lucy (28) majored in business administration at LMU (Ludwig-Maximilians-University of Munich) and predominantly takes care of operational activities and finances. Pascal (25) studied computer science at the TUM (Technical University of Munich) and works on platform development. Mark (26) studied technology and management-oriented business administration at the TUM and is responsible for marketing and partnerships. Mark was kind enough to answer our questions. Mark, how did the business idea for useley develop? It was not the way you imagine, that it comes to you while you’re in the shower. Instead, identifying the idea was a long process. We work with a strong focus on the lean startup / customer development methodology. It was only after various brainstorming sessions and many interviews that we decided to implement the idea. Is your idea really that new? Several platforms do already exist that have tried to solve the problem using different approaches. Yet no particular platform has stood out among the rest. According to a survey by the German news magazine Spiegel, 62% of young Germans would use this kind of platform. However, less than 2% have actually used one. 3. the handover process is complicated. As a result, we first like to inspire users to partake in certain events — by selling something like a “FIFA Evening with Friends”, instead of simply renting out a PlayStation. We also offer insurance for both parties and have a network of partner shops to make picking up and dropping off products more convenient. Gaining the first 100 customers. Our concept requires us to break people’s habits, and that is always difficult. In the beginning, we did a lot of hands-on work ourselves. As an example, the founders took to the streets of Munich for the first 200 orders, and we delivered GoPros and fondue sets to customers ourselves. The level of uncertainty was also really high in the beginning. We were often told that people would not accept the concept. Are you able to refute that now? How is business going? We have had more than 1,200 transactions in our pilot city of Munich – one of which was delivering a PlayStation with FIFA to FC Bayern. Our average transaction volume amounts to 36 euros and has grown by over 30% each month since last January, even though growth is not our current focus. We are still systematically validating the main hypotheses of our business model, and have been able to check off quite a few items. What is your insider tip for other startups and founders? The tip is that there is no insider tip. People are always looking for a special tip to help them reach a goal or have them sitting pretty with as little effort as possible. They are always looking for shortcuts. Unlike when you are in school, college or at work, tricks do not work when starting a company. You might be able to convince your teacher or boss that you are doing a good job based on your outstanding attendance. When it comes to developing a business model that works and offers a large number of customers genuine added value, there are no tricks. Of course, you can – and should! – be really nice to your customers. However, if your customer does not actually need your product, none of that helps. You were in the LMU Lab, pitched to Impact Hub, and are networked with UnternehmerTUM and CDTM – what have you gained as a result? They are all fantastic institutions that taught us so much in so many areas – useley would not exist without that knowledge. We all got to know each other at the CDTM, where we were able to learn the tools of the trade. We continue to benefit from an unbelievably helpful network of successful founders such as Stylight, Freeletics, eGym, etc., as well as our advisors and investors. We were able to establish numerous contacts and received valuable advice at the LMU Lab. At Impact Hub, we were able to sharpen our understanding of sustainability funds and learned quite a bit about storytelling and marketing. We are so grateful to all of these institutions and are very pleased with how well the Munich scene has developed in recent years. He meant that we needed to be very hands-on in the beginning to have the most genuine understanding of the useley customers and our business model. 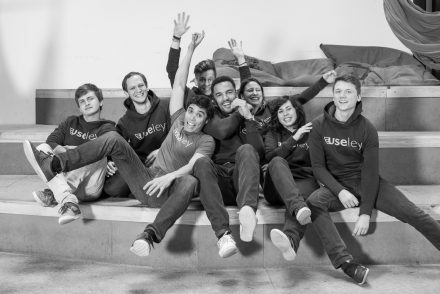 Useley wants to become the Airbnb of products – they seem to get along quite well with Nathan Blecharczyk (second from the right), the co-founder of Airbnb. That is why we performed our very first transactions by hand, without writing a single line of code. 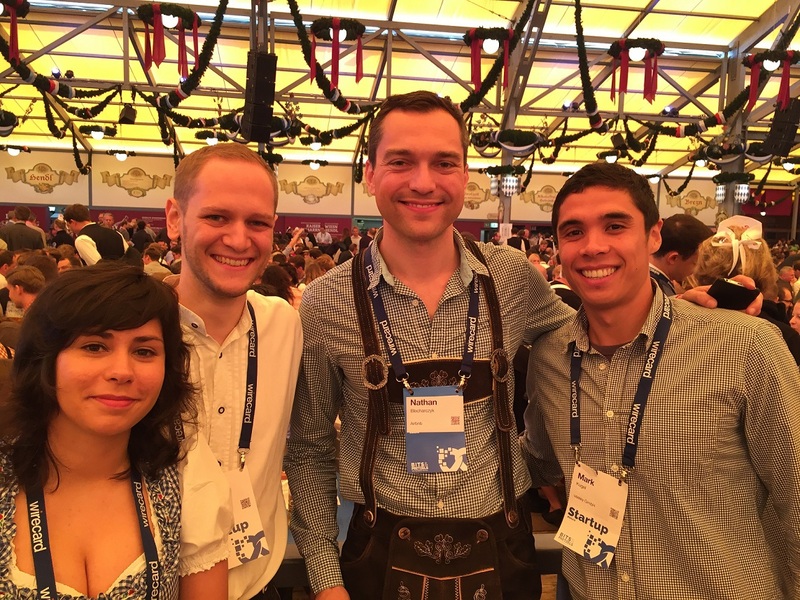 We walked through downtown Munich with paper registration forms and personally recruited owners and borrowers. That experience taught us an enormous amount and allowed us to understand the process better than most of our forerunners. Beyond understanding customers and the process, what do you think is the determining factor for the sustainable and successful development of a company? For us, the most important factor was – and still is – o ur team. A good team can turn a not-so-great idea into a successful startup. A ‘bad’ team will often fail even with a good idea. Startups are hard. You often work 14-hour days together, make unpleasant decisions and have to solve small and large crises on a weekly basis. If you are not able to work together well on a personal and professional level, you are destined to fail sooner or later. In five years, we want to be an integral element in the lives of our customers. Just as it has become completely normal to book an Airbnb when traveling, in the future people will simply order a camera for their vacation or a Polaroid for a wedding from useley. We also want to be present throughout Germany and in additional countries. We wish you continued success and would like to express our sincere thanks for the candid conversation.